The U.S. government's ten-month probe into Toyota validates the initially unpopular argument we at Jalopnik put forth at the start of this unintended acceleration witch hunt: This was a case of people pressing the wrong pedal. In every way, this was Toyota's beige-ification of cars biting them back, and hard. The probe by the National Highway Traffic Safety Administration and NASA scientists examined 280,000 lines of Toyota software, 3,054 complaints of sudden acceleration in Toyota vehicles and several dozen individual vehicles. "There is no electronic-based cause for unintended high-speed acceleration in Toyotas. 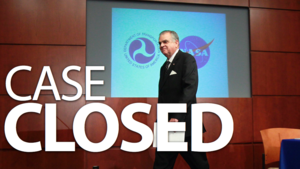 Period," said U.S. Transportation Secretary Ray LaHood. NHTSA officials said the causes were the ones they suspected all along — bulky floormats, sticking gas pedals and driver mistakes. "We found that when a complaint alleged the brakes didn't work, what most likely happened was pedal misapplication," said deputy NHTSA administrator Ron Medford. Yet the proposed solution? More electronics and more regulations. NHTSA officials say they'll now push forward with three new rules for vehicles, requiring brake-override software, electronic data recorders and new rules for keyless ignition so that people don't get confused when they have to shut down a car by holding a button for one-Mississippi two-Mississippi. NHTSA will also study pedal design, to see whether vehicles need to be designed with podiatry standards in mind. In the heat of the recalls last fall, everyone who complained of sudden acceleration had the benefit of the doubt, and even today, LaHood tried to claim that "nobody up here has even insinuated the term 'driver error.'" Why not? We know what Toyota did wrong: it's mechanical and business mistakes led directly to four deaths and several injuries, and it faces hundreds of lawsuits and a dented reputation for ignoring defects. We know what's wrong with Toyota's software: Nothing. Why avoid discussing what many drivers did wrong — mistake the gas for the brake? Human nature suggests some of those who claimed sudden acceleration problems without a defect will likely go on believing the government just overlooked something rather than admit a smidgen of responsibility. New rules for safety technology will take several months, if not years, to put into place, while the technology on vehicles will require several more years to filter into production. Even then, it will only protect those who buy new models, not the ones on the road today. Where's the call to improve American drivers? Where's the charter to make driving an essential skill rather than a chore which should be handed off to computers as much as possible? If part of the Toyota imbroglio stems from people becoming disconnected from driving their vehicles, part of the answer should be to restore that connection — rather than making every vehicle as somnambulant as the worst Toyota.